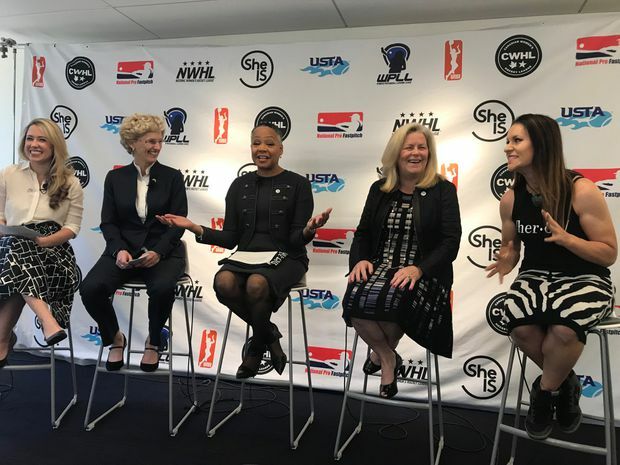 Left to right: Caiti Donovan, executive director of SheIS; Brenda Andress, commissioner of the Canadian Women’s Hockey League; Lisa Borders, president of the WNBA; Stacey Allaster, chief executive for the US Tennis Association; and Jen Welter, the first female NFL coach. Lisa Borders, president of the Women’s National Basketball Association, received a phone call a few months ago from a Canadian woman she’d never met. There was a fascinating opportunity awaiting her on the line. It was Brenda Andress calling from Toronto. Andress, the commissioner of the Canadian Women’s Hockey League, is a woman who spends her days on many of the same complex challenges that Borders does: trying to expand the profile, attendance, viewership and sponsorship dollars for her league of world-class female athletes. Andress explained her big idea. What if the WNBA and the CWHL could work together to cross-promote their leagues? And what if they didn’t stop there? Why not reach out to as many female leagues as possible, and start a larger movement to collectively elevate women’s sports? That’s how the SheIS initiative was born. Their group now has several more women’s organizations in the fold, including World Wrestling Entertainment, the United States Tennis Association, National Pro Fastpitch, Canada Basketball, National Women’s Hockey League and the Women’s Professional Lacrosse League. Striking at a time when the social discourse about equality for women is red hot, it’s the first time female pro sports leagues have joined together for the launch of one cause. A handful of high-profile women are in the fold and speaking publicly. Stacey Allaster, the chief of professional tennis for the USTA, came aboard, along with Jen Welter, the first female coach in the NFL. Stephanie McMahon, WWE’s chief brand officer and the daughter of Vince McMahon, joined the cause, conversing about it on Twitter with WWE wrestlers and her 2.8 million Twitter followers. The various leaders met in April at the WNBA’s New York headquarters to speak in front of supporters and investors. They partnered with TSN to film a public-service announcement, and they launched a campaign on social media. As several of the league leaders gathered on a stage for a panel discussion before an intimate audience of supporters in New York, it became obvious. Women need to support other women, they agreed. Why treat other female sports leagues as competition in the marketplace, when they could be allies instead, cross-pollinating one another’s fan-bases? Some easy ideas have kicked off the initiative. Each of the league leaders has pledged to attend one another’s events and bring others along – and not as VIP guests, but by purchasing tickets. They’ve built a website (SheISsport.com) that aggregates a growing list of women’s sports schedules. Their SheIS social-media campaign calls for people to post a photo or video of themselves attending or watching a girl’s or women’s sporting event, then nominate three friends to do the same. Allaster, who plays a role in tournaments within the U.S. Open series, believes those events could possibly be a vehicle for cross-promoting other female athletes. SheIS is now its own business, fully incorporated in both Canada and the United States. 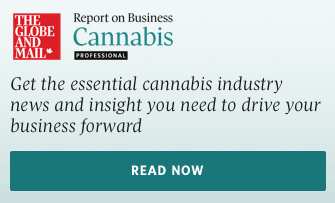 It has filed in both countries for charitable status and is supported by its partnering leagues – either via funding or resources, such as marketing support. It has an executive director, Caiti Donovan, a woman with a diverse strategic-marketing background that includes stints with Spotify and Viacom. Among her tasks, Donovan is working to forge partnerships with other sports leagues and women’s advocacy groups, media partners and sponsors. SheIS is currently reaching out to women’s university programs and the Ladies Professional Golf Association, and will contact the National Women’s Soccer League once the NWSL concludes its search for a new leader. SheIS is conversing with men’s pro leagues for their support, too. The attention gap between men’s and women’s sports remains immense, but the climate to attempt change has never been better. Women’s issues and movements are making news daily, and Canada’s 2018 federal budget includes $30-million over three years to research, support and promote women and girls’ participation in sport. Andress dreams of someday getting SheIS logos affixed to the uniforms or helmets in the partnering leagues, or having SheIS-themed nights in those league venues. She wonders if a coalition of a few women’s leagues might be more attractive to some corporate sponsors than one league making a pitch alone.